BUYING AN INVESTMENT PROPERTY ON THE GOLD COAST? The Gold Coast is one of the fastest-growing cities in Australia, and its property market offers some great opportunities for the educated property investor. As Australia's sixth largest city, the Gold Coast property market has now reached a level of critical mass in its population and economy to deliver greater long-term stability for the investor. Values are increasing and rental yields remain high, while strong future population growth, improving infrastructure and shortages of quality property should drive long-term price growth. But perhaps more than any other city, you need to have a good understanding of the Gold Coast and its property market before you buy an investment property here. Don't be seduced by the idea that because it would be a nice holiday home or retirement property, it will make a great investment. It probably won't. If you want to make money out of your Gold Coast investment property, you need to do your research. What's Driving the Gold Coast Property Market? Where can i invest on the gold coast? This area consists of the most well-known beach suburbs on the Gold Coast, including Surfers Paradise, Broadbeach & Mermaid Beach as well as the Coast's CBD of Southport. It boasts a mixture of high density units in Surfers and Broadbeach, reducing to medium density units and luxury housing along Mermaid Beach and Miami. Southport is a priority development area with a large concentration of high-density units, although there is plenty of traditional housing and lower density development in its immediate surrounds. There are also a number of suburbs built along canals running immediately inland from the beach, such as Bundall, Broadbeach Waters, Mermaid Waters and Clear Island Waters. This area is the main centre for tourism, holiday accommodation and nightlife. Looking north towards Surfers Paradise, Main Beach and Southport. While high-rises are symbolic of the Gold Coast, they generally make poor investments due to the lack of owner-occupier demand and continuing issues of oversupply. This area runs from the famous Burleigh Heads south to the QLD-NSW border at Coolangatta. There are patches of high density development within Burleigh and Coolangatta, although there is also detached housing and duplexes scattered throughout the area, particularly in the beachside suburbs of Palm Beach and Tugun. There are also many low-rise beachfront units along this coastal stretch. With wide, northerly facing beaches and hinterland views, this is a very attractive part of the Coast. The region also houses the Gold Coast International Airport - an increasingly important piece of infrastructure driving growing visitor numbers to the city. The southern beaches of the Gold Coast have a lower supply of property and more restrictive zoning, making them a better investment than the higher-density areas at the northern end of the coast. 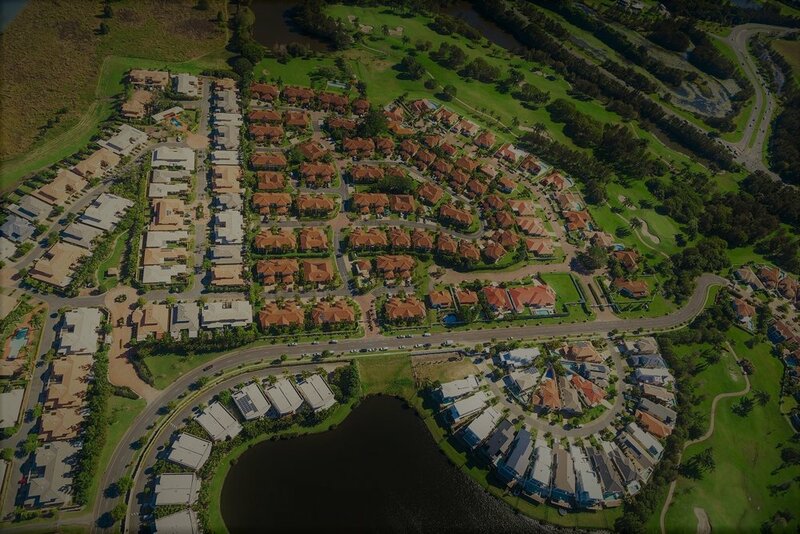 This is the largest suburban area of the Gold Coast, and houses most of the city's traditional suburban housing. It sretches from the development areas of Pimpama, Oxenford and Coomera in the north, through to established suburbs including Ashmore, Parkwood, Arundel and Helensvale in the centre and Nerang, Highland Park and Carrara to the south. Property types vary from new house and land packages and townhouses in the newer suburbs, through to less modern but more diverse styles in the established areas. The area boasts the new Gold Coast Hospital precinct, alongside Griffith University, as well as the various Gold Coast Theme Parks. Properties along one of the Gold Coast's many canals. There are plenty of areas with good investment potential away from the Gold Coast's beaches. The major populated suburbs in the south are Robina and Varsity Lakes, which are relatively new creations built around the Robina Town Centre and Bond University. There is a mixture of detached houses, duplexes and townhouses spread throughout the area, with medium density apartments surrounding Robina Town Centre and Bond University. Nearby are the hinterland suburbs of Mudgeeraba, Tallai and Bonogin, and further south are the beautiful Tallebudgera and Currumbin Valleys. Hinterland properties generally have larger homes and block sizes. The main areas of employment in this region is the Robina CBD and the Varsity Lakes business precincts. Most suburbs have easy access to the M1. WHAT is a good investment property on the Gold Coast? One of the keys to successful property investment on the Gold Coast is to understand that it is a proper city - not just a tourist destination or retirement village - and plan your investment accordingly. My strong recommendation is to look at properties and areas that aren't purely occupied by tourists, but have appeal to a range of demographic groups. It's also important to realise that incomes are not as high on the Gold Coast as they are in many of our capital cities, which means you need to be more careful around price. Properties with good amenity, but also close to job sources and quality infrastructure. Flexible properties that appeal to a range of different buyers and renters, such as modern detached houses, duplexes, townhouses and units in small complexes. Properties within the key price range of $350,000-600,000. Be very careful about new house and land packages and townhouses in the northern growth corridor. There is a lot of new supply coming on here and many are overpriced, with large commissions built in for those selling them. Lifestyle properties with 'resort' style facilities - these are generally too expensive and have large body corporates, making them unattractive to the average owner-occupier. Already have a property in mind on the Gold Coast? Want a second opinion? How do we help Gold Coast Property Investors? Provide ongoing service to ensure your property is professionally managed and maintained. We specialise in buying high-performing properties on the Gold Coast at below market price. We don't sell properties or take commissions, so our advice and services are fully independent and in your interest. Book a consultation with our local expert and Qualified Property Investment Adviser, Andrew Wegener. Get the latest insights, property market knowledge and buying strategies, and discuss your plans for investing in Gold Coast property. It's one-to-one, at a time of your choosing, and it's cost and obligation-free. Best of all, Andrew's advice is completely independent. Find out what's happening in the Gold Coast Property Investment market.